"Three against the wilderness... nothing could stop them - only instinct to guide them across 200 perilous miles of Canadian wilderness!" 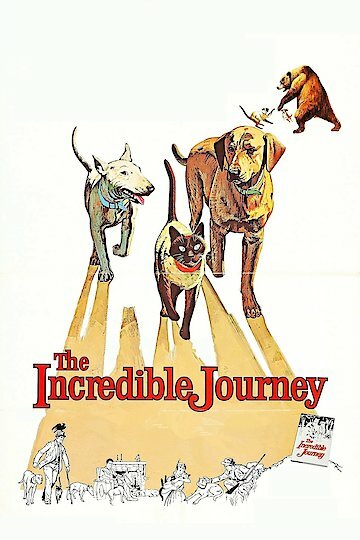 In The Incredible Journey three friendly pets, a cat and two dogs, lose their owners during a vacation in the wild Canadian wilderness. The lonely, lost pets form a special bond as they search for their beloved owners in the sometimes dangerous wilderness. The frightened animals must use their natural instincts and each others special skills to try to survive in this suddenly strange land. Meanwhile their human owners are also trying to find their beloved missing pets who they fear might come to great harm in the perilous wilderness. The Incredible Journey is currently available to watch and stream, buy on demand at Amazon, Vudu, Google Play, iTunes, YouTube VOD online.